A classic pearl choker is a symbol of elegance and class. It will never go out of fashion; on the contrary, it will increase its intrinsic value as the years pass. While many women are used to wearing a pearl choker necklace with crew-neck tops or dresses, they also go great with office suits and even with casual outfits – if styled correctly. Being short in length, a choker pearl necklace beautifully compliments your neckline, lifting your complexion. Moreover, if combined with simple pearls set containing pearl stud earrings and a bracelet, the effect is spectacular. However, the fashion world of our days is constantly changing and evolving, becoming more and more creative. There are now a myriad of unconventional ways to wear and style your pearl choker. If you take a look at the latest costume jewelry collections signed by Chanel or Vivienne Westwood, you will see pearl chokers getting a lot of attention. Innovative designs, unusual necklaces – these are the best times for pearl lovers. This is why today we want to present you with five elegant ways to style your classy pearl choker and turn it into a timeless, fabulous new accessory. Give your pearl choker necklace a completely new look and attitude by installing diamond rondels in between all pearls or here and there for a spectacular effect. 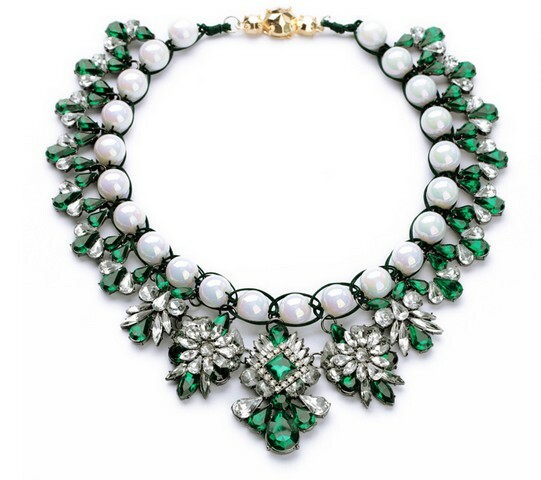 This styling can turn your vintage choker pearl necklace into a piece of art. It can also become a perfect bridal accessory to wear or to gift. This styling is very popular in the U.S. and the U.K. and you will see a similar version using white or yellow gold rondels as well. You should visit an expert jeweler to install the diamond rondels, but you won’t regret it for a second. Whether you have a perfect white freshwater pearl necklace or a sensual black pearl choker, the diamond rondels are an exquisite add-on you will enjoy from here on end. If you want to take things up a notch, you can also add a small, refined diamond pendant to your new pearl/diamond choker. Multi-strand necklaces are nothing new under the Sun, but still make one of the most unusual ways to style a pearl choker if you feel like giving your old pearl choker a new spin. The only rule to follow when styling in this manner is that you should use similarly colored pearl necklaces. You can turn the simple, formal pearl choker into a statement piece of jewelry if you add more pearl necklaces over and over. A double layer may suffice, but usually, this styling requires a larger number of necklaces. The best part is that you don’t have to buy new veritable pearl opera or rope necklaces to pull this look off. Faux pearls and imitation necklaces, if of high quality, don’t cost a fortune and add beauty, style and value to your precious pearl choker. A beautiful classy pearl choker necklace can be matched perfectly with a golden chain (or more) for a bit of casual, street-smart style. Pearls on gold chains have been in fashion for many years, but an easy way of styling a choker is to pair it with a golden chain or more. The versatility of the pearl necklace is amazing: it can go great with a thin, classy golden chain or a golden plated, chunky ghetto-style statement one with no problems. You can pair one choker with two or three faux pearls opera or rope necklaces and add a bit of sparkle with a golden chain. If you want even more bling and pearl frenzy to truly turn you into a red carpet movie star, simply add more necklaces and chains to pump up your diva style and your low-cut cocktail dress. A brooch can completely change the looks of a pearl choker. You can choose a simple one to clip on the necklace as a pendant or use a larger one to clip together 2 or 3 strands. A double, a triple or a multiple strand necklace can turn into a true piece of art if you choose the right pendant, brooch or even ribbon. Pearl brooches come in many styles, shapes, and designs: vintage Swarovski crystals and intricate montages, gemstone statement models, beads and ribbon flowers clip-on pendants, sky is the limit. You can take advantage of a clip-on pendant or brooch to add color and a more contemporary look to a Tahitian pearl necklace for instance. The wide variety of styles you can achieve with a brooch is mind-blowing. Pick a large, sparkling, statement one for a night of shine and glory, or a simple, minimalist, and colored gemstone-based to go with your day outfit at work. If you want to go for a more oriental style and achieve a statement necklace, all you have to do is mix your classy pearl choker with other necklaces of the same length or longer in different colors. Some might consider it a bit too much, but if you pick the correct nuances and stone types, you will look like a true queen in one of Scheherazade’s stories. Everything is allowed: beads, gemstones, wood, metals and so on. Of course, your black pearl choker can compliment any beads necklaces in warm tones while a smooth white choker can tone down a multitude of colors, textures, shapes and lengths. Such styling is recommended with matching dress colors and goes well with themed parties or events. Such types of styling are easy to achieve and can turn a classy pearl choker into a modern and unconventional piece of jewelry to enhance your natural beauty, neckline, complexion, and personality. Loved by queens and worn by superstars, the pearl choker necklace is not only a valuable acquisition but one of the very foundations of elegance and style.